One of the most common things that people with psoriasis are concerned about is whether it could be given to another person. Perhaps a mom who has psoriasis wonders if she should hold her child during an outbreak of lesions or a caregiver worries that they may spread the problem to the person they are near. You do not need to wonder anymore. The answer to the ultimate question about “Is psoriasis contagious?” is simple. 1 I want to know – psoriasis is contagious or not? 2 If Not Contagious Then How Did You Get It? I want to know – psoriasis is contagious or not? The simple answer is, “No.” You cannot give it to another person nor can another person cause you to have it. There is no known reason that it may affect you but not others around you but that is not the way psoriasis works. However, the current idea on how a person may end up being someone who suffers from it is that it may be linked to some genetic part of you and your family or your immune system. If Not Contagious Then How Did You Get It? In normal situations skin cells grow gradually and then they flake off approximately every 4 weeks and new skin cells grow to replace it. 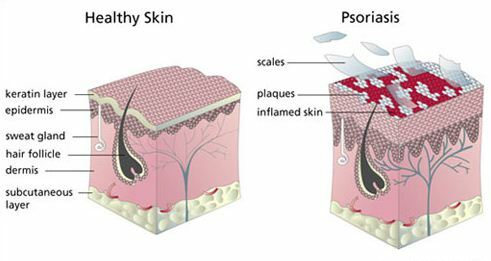 However, with people who are affected by psoriasis the skin cells seem to grow much quicker and this creates the thick, silvery, white or red patches of skin on your body. The rapidly growing skin grows in days as oppose to weeks which means that you end up with several layers of skin stacked up on top of each other. This patch of skin that grows rapidly may be of various sizes and it may appear more often on knees, scalp, feet, and elbows or even the lower back. Most experts feel that the quickly growing skin cells happen because a person’s immune system goes into overdrive. That it over reacts to something and causes inflammation and then flaking skin. There is also some research that shows that it can run within a family. This means, if your parents have it, you may have gotten it from them and unfortunately, you may also give it to your children though simple genetics but not because of the whole, “Is psoriasis contagious” concern. Avoid medications that are NSAIDS which are non-steroidal anti-inflammatory drugs as well as some medications that are used to treat high blood pressure or mental illnesses. Smoking may also cause flare-ups, especially for women smokers. Not every person can avoid stressful situations at all times nor could you always avoid cold, dry weather conditions. Just do your best to try and protect your skin. If you have any questions regarding the potential for you to develop symptoms of psoriasis do not hesitate to ask your doctor or your dermatologist, especially if there is a family history of it in your family tree. The bad news is that psoriasis, once you have it, is not considered curable. There are no proven cures. There are only treatments available that will help you cope easier with the symptoms of psoriasis. Skin moisturizers, creams from your dermatologist, and other natural remedies or things your doctor may recommend are all viable treatments. The good news is that if you do develop psoriasis due to an unexpected amount of stress, an infection or some other issue within your life, it does not mean you will always have the flare-up. Most of the time, symptoms of psoriasis will come and go. The things you do will have an impact on how often your outbreak may be as well as what the severity of it is. Even though there is no cure, most people are relieved to know that the question of, “Is psoriasis contagious or not” is that there no concern for others you may come into contact with. Even skin to skin contact will not affect the other person. If this has been a concern for you, you can rest easier knowing that the ones you love will not be affected.